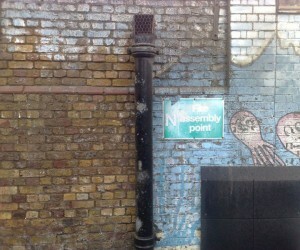 Do you have graffiti on your building or property that you want to get rid of? You might be tempted to buy an over-the-counter graffiti cleaner. However, this may cause you a lot of time and frustration. Let our team at Fortress Restorations, who have the experience, take care of unsightly tagging. Why should you hire a professional graffiti removal service? Did you know that the temperature of the surface can affect the type of graffiti cleaner used? Many off the shelf graffiti cleaners are water-based and not solvent-based. Water-based cleaners, such as what the professionals use, is only good during the summer months. What if you need graffiti removal in cooler weather? Our professional team use both solvent and water-based cleaners for graffiti removal. We have methods and use graffiti removal cleaners that will get into the crevices and pores and will not quickly evaporate. This gives our cleaners the time to work and get deep into the pigment of the paint. 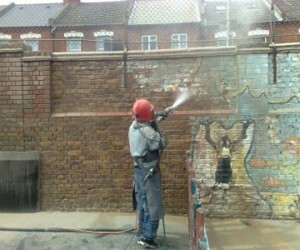 We also have the right equipment for graffiti removal, such as a low to medium pressure washers to deliver the cleaners. Let our professional team at Fortress Restoration remove the ghosting effect and have your building or property looking like new again. Ring us today to ask how they we can remove graffiti for you!